This Honey Mustard Chicken is loaded with flavor and goodness and is lick-your-plate delicious! 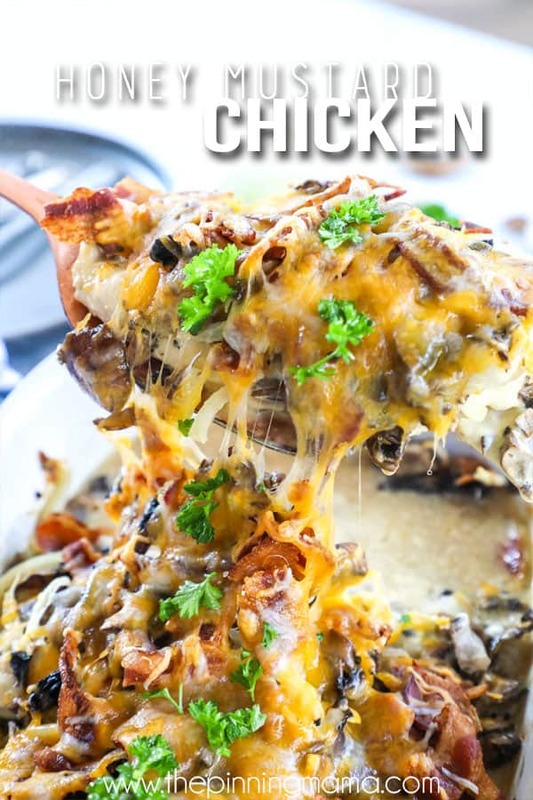 It has the perfect combination of the sweet and tangy honey mustard coating tender chicken with savory mushrooms, onions, and bacon balancing the flavor. Of course, to top it off it is smothered in rich shredded cheese that melts into pure perfection. This Honey Mustard Chicken is a one dish, crowd pleaser that is requested over and over again! I know a recipe is a winner when it impresses my husband, because as wonderful as he is, he is hard to please at the dinner table. This Honey Mustard Chicken got his highest praise! This recipe is a bit of a throwback to one of my favorite meals growing up. Alice Springs Chicken from Outback Steakhouse. Although I wouldn’t call this Honey Mustard Chicken a copycat, I took inspiration from the flavors I loved so much in that dish and packed them in a couldn’t-be-easier kind of dinner. 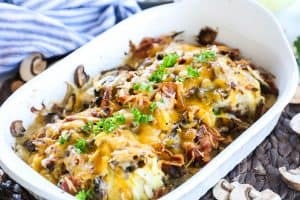 In this dish you will find perfectly seasoned tender chicken breast, tangy honey mustard, perfectly cooked mushrooms, sweet onions, salty bacon and of course just the right amount of rich and delicious cheese to top it off. Not only is this combo a winner, but I figured out how to get it to all cook perfectly in one dish, so one point for easy meal prep and another for easy clean up. This is a super comforting meal, so I like to carry that over to the side dishes served with this dish. You can go with classic sides or keep the dish lighter by choosing healthier sides. Either way, pairing Honey Mustard Chicken a couple of these will make a super filling and delicious meal. Mashed Potatoes- This is probably my #1 side suggestion for this. I especially love these Instant Pot Mashed Potatoes. Rice- jasmine or wild rice both pair well. It is especially good if you spoon the juices from the chicken into the rice as you serve it. Garlic bread- Since this flavor inspiration did come from a steakhouse, there is something about a big piece of steakhouse quality bread that goes so well with this meal. French fries- This is what Alice Springs Chicken is served with. You can make Air Fryer French Fries, or these oven baked garlic smashed potatoes are a great substitute for fries! Side Salad- Do it steakhouse style with iceberg lettuce, cherry tomatoes, croutons, and delicious homemade ranch dressing. Sautéed Green Beans– These are my go to easy veggie! They only take about 5 minutes, start to finish and are crazy good! Cauliflower Rice- You can buy this fresh or frozen at most stores or make your own. Broccoli slaw– This simple salad has perfect flavors to compliment Honey Mustard Chicken. Steamed Broccoli- …. or cauliflower! If you need to be quick, just pair the Honey Mustard Chicken with one of these sides that you have on hand, or if you are looking to make a heartier meal, go ahead and put two or three of these on the dinner menu! If you have a favorite side dish that I missed, make sure and leave me a comment in the section at the bottom of this post. This recipe is super simple! 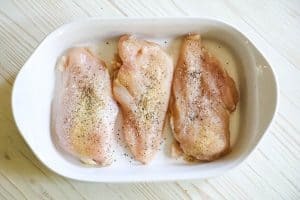 I am going to walk through an overview of how to make Honey Mustard Chicken here, adding in some of my tips and recommendations for this recipe. Make sure to hop to the bottom of this post to find the FULL printable recipe card. First, trim your chicken breast. If the chicken is average to thick, I would recommend cutting it so that it is half the thickness. This will help it cook more quickly and evenly and result in more tender chicken. Lay the chicken breast flat in a large casserole dish so that they are not touching. Season the chicken as directed. Then spread a layer of honey mustard on each chicken breast. Make sure to have a dish big enough to fit all of the chicken and toppings in without too much crowding. This will help reduce the liquid that is in the pan at the end since it has room to bake off and evaporate. Chop the mushrooms roughly and slice the onions extra thin. The more thin the onions are the more fully they cook and the sweeter that they get. Toss the mushrooms and onions with the oil and remaining seasonings to coat. Layer the mixture on top of the chicken, evenly over the dish. Then place on the middle rack of the oven and bake uncovered for 30 minutes. I always bake my chicken uncovered because it allows excess liquid to evaporate and intensify the flavor of the dish. The oil coating the vegetables should help them stay moist enough not to burn. With that said, each oven cooks differently, so it is always smart to keep an eye on your Honey Mustard Chicken the first time you make it and if at any time it starts to become more browned than you like, just loosely cover with a sheet of foil. 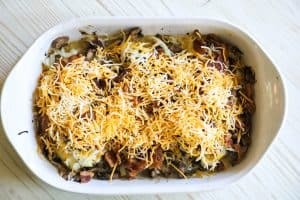 At the 30 minute point, add the crumbled bacon and cheese on top of the dish and place back into the oven to finish baking for an additional 5-10 minutes. Once it is done, garnish with parsley if desired and serve warm with your favorite sides! Now, when I have made this we generally don’t have leftovers, but if you do, you are in for a treat, because there are some seriously awesome meals that you can make with the leftovers! Honey Mustard Chicken Wraps– Grab an oversized tortilla or some Lavash bread and layer on a drizzle of honey mustard, slices of the leftover chicken with toppings, chopped lettuce, and cherry tomatoes cut in half. Roll the wrap up and wrap in foil. If you want a heartier meal, add rice or quinoa to the wrap. Honey Mustard Chicken Quesadillas– Chop the leftover chicken into small bite sized pieces and mix with the leftover toppings. Place a scoop of the meat mixture on a tortilla and top with some additional colby jack cheese and an extra drizzle of honey mustard and fold in half. Cook each side of the tortilla on a hot griddle with a little bit of butter until golden brown and the inside is heated through. 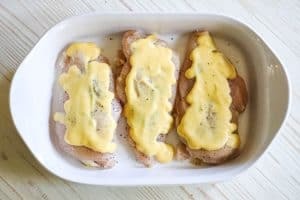 Honey Mustard Chicken Zucchini Boats– Shred the leftover honey mustard chicken and mix in with the toppings and juices. Add black beans to the mixture then scoop generously into zucchini that has been halved and hollowed. Top with an extra sprinkle of cheese and bake at 350 for about 20-25 minutes or until the zucchini is tender and the chicken is heated through. Honey Mustard Chicken Salad– Chop leftover chicken into bite sized pieces and mix with toppings. Fill a bowl with chopped romaine, or your favorite greens. Top the greens with a generous scoop of chicken, cherry tomatoes, green onions and croutons. Drizzle with honey mustard or ranch dressing. Can you use chicken thighs, chicken tenderloins or other cuts of meat in this dish? Yes, any variety of boneless, skinless chicken will work in this recipe. You can choose based on your family’s taste preferences. Please note that the cooking time may change depending on the type of meat selected. What kind of bacon do you use for the Honey Mustard Chicken? I like to make sure that the bacon I use is high quality and super crunchy. This helps with the texture and flavor of the dish. I prefer to cook the bacon in the oven until crispy then crumble it. You can make batches like this and then freeze and thaw to use as needed. I also have easy instructions for how to make bacon in the microwave here! Can you freeze Honey Mustard Chicken? Yes, Honey Mustard Chicken can be frozen either before or after cooking. To freeze it before cooking, assemble the dish through step 3. Freeze flat, and when ready to bake, thaw completely before cooking. Resume the recipe at step 4 and cook as directed. To freeze after baking follow the directions above in the leftovers section. Yes, the ingredients in this dish should be easy to find gluten free. You will want to verify to confirm that each ingredient and specific brand is in fact gluten free. Do you have more chicken recipes that are this easy and delicious?! I really do hope that your family loves this recipe as much as mine has! If you do get a chance to try it, I would love it if you let me know! Not only does it make my day, but it also helps my website when you leave a review! You can leave me a comment below, or if you post a picture on Instagram, make sure to tag me @easyfamilyrecipes so that I can see what you are cooking up! It makes my day to see others enjoying the recipes that I share! This Honey Mustard Chicken is loaded with delicious flavors and simple to make all in one dish. 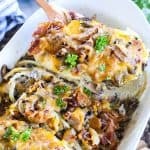 With layers of tender chicken, honey mustard, mushrooms, onions, bacon and cheese, you will not believe how something so easy can be so delicious! Lay the chicken breast flat in a large casserole dish. Season with 1/4 tsp of each, salt, pepper and garlic powder. Spread 1-2 tbsp of honey mustard on top of each chicken breast to make a nice thick layer. 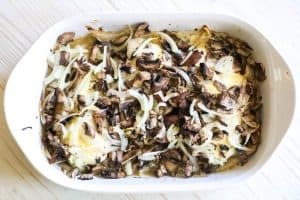 Combine the chopped mushrooms, thinly sliced onions, oil, and remaining salt, pepper, and garlic powder in a bowl and stir to coat. Then spread the mixture over the top of the chicken. Garnish with parsley and serve with mashed potatoes, rice, or your favorite side dish. Enjoy! Where can I find the recipe for honey mustard dressing? Hi Yvonne- I use already prepared honey mustard dressing. The brand I used here was Ken’s but they sell many kinds on the salad dressing aisle. If you want to make your own though, you can find lots of recipes on pinterest or google, although I don’t currently have one on my site. Enjoy! The directions say honey mustard but in your comment to someone you said you used honey mustard dressing. Does it matter if you use dressing or just honey mustard? I am making this tonight as it sounds so good but before I even get to that I am going to follow you. Your recipe gives the best detail ie. spacing chicken breast, slicing the onion thin to get the best flavor. I am not a novice cook but my recipe don’t always turn out right. Last week I made a chicken dish and it was watery, the taste was not up to par . Now I understand where I went wrong. Please keep your instructions as you have now because I am looking forward to using them!!! Thank you so much for your kind words Judith! I hope that you enjoy this and all of the future recipes! I having a problem on mobile right now but if you use a desktop computer it should show at the bottom of the recipe card. Sorry!